ACCEPT guitarist Wolf Hoffmann was interviewed by Metal Eye Witness before the band's November 17 concert in Buenos Aires, Argentina. You can now watch the chat below. 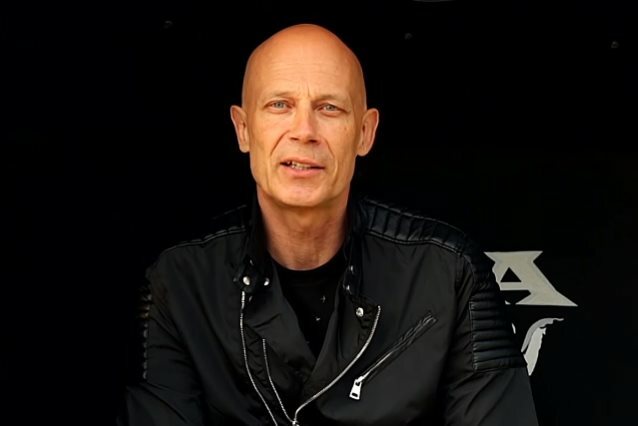 Asked if ACCEPT intentionally revisited some of its earlier classics while writing the music for its latest album, 2017's "The Rise Of Chaos", Hoffmann said: "It's almost impossible to plan these things to that detail. You really just write the songs at the time when you write them, and you write them the way they come out. And you cannot really say upfront, 'Well, I'm gonna write an album that has these and those nuances,' You really just write in the mood that you're in and whatever comes out comes out. Of course, you have to be your own judge and you have to sort of filter the stuff, which [means that] we write a lot of songs — I don't know; 100 songs — and we pick the 10 best ones that we can find. But it's impossible to really finetune a direction upfront; they just sort of take a life on their own. And when you're in the studio, you just give the song what you think it needs, and that's really all the influence you have." Regarding what aspect of the touring life has changed in the four decades since ACCEPT was launched, Hoffmann said: "Surprisingly, little has changed, quite honestly. Everything else in the music business has changed dramatically — the way we record the albums, the way we distribute the music, the way we sell it; all that stuff is completely different from 20, 30 years ago. But, really, touring? It's still about packing your guitar and go on a plane and travel to another country and perform the show. So we have different tools nowadays, but, really, the principle of playing a show to an audience, that's exactly the same as it was back then… Some things get easier; others get much more difficult. Like traveling on airplanes, for instance — [there are] all these restrictions; you can't take anything anymore. It used to be easier in the '80s, but so be it. But, really, the process of being on stage and firing up the audience and the audience firing up you, that's exactly the same as it was back then. So that's a good thing; I don't think that will ever go away. The digital technology can't change that experience, I don't think. I mean, nowadays they have holograms and all these things; I don't know what to think of that. But, really, what we do is still the one-on-one contact with the audience." Hoffmann also spoke about the possibility of ACCEPT celebrating a milestone anniversary of one or more of its classic albums — such as "Restless And Wild" and "Balls To The Wall" — by performing it in its entirety on a future tour. He said: "Probably not. I mean, I've never been a huge fan of this whole idea. It seems to me like a marketing gimmick more than anything. Because in our age, we could have an anniversary every year. 'Cause it was 35 years [ago that] 'Restless And Wild' [was released], 40 years ago this, 30 years that — every year would be another anniversary — and, to be honest, we're so busy with promoting our current stuff that we don't really feel the need to do all that nostalgia stuff. Every year we have a new album, or every other year, and we've made four albums and a live album, so that's five, and I made a solo album — that's six releases in eight years. So I don't think we need to bother with any anniversary stuff at the moment. Maybe one day when we have nothing else, no other ideas. And we've done, actually, one show once where we played a complete album, and it was okay. But, quite honestly, I think we have a perfect setlist of old songs and new songs. I wouldn't rule it out, but at the moment, I've always said, why bother?" "The Rise Of Chaos" was released on August 4 via Nuclear Blast. The cover artwork for the disc was created by the Hungarian artist Gyula Havancsák.